Yesterday Jonathan and I went back into Ashwood studios to mix 7 tunes we recorded last July. Despite my anxiety about going into the studio, something that has come through years of sound engineers telling me red is black, we had a really productive and positive time. Thanks Sotos! Sotos made light work of our head sratching, ear splitting problems and I am hoping the master copy will sound great too. 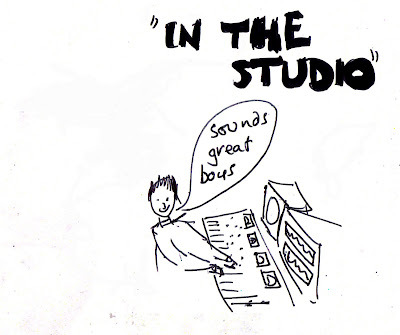 I forgot to take my camera along so I have drawn a picture for you all to look at of Sotos hard at work at the mixing desk (yes, thats what it is). As you can see I haven't paid as much attention to my drawing skills as my guitar playing.